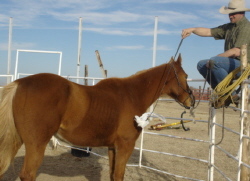 Flagging your horse from the fence is something you want to do after they are used to it from the ground. I get my horses used to a flag on the ground as well as using one when I’m riding them. (A flag is just a short whip, 4’ long or so with a plastic grocery sack tied on it) I don’t hit them with it; just shake it all around them. This sounds easy, but just try it on “old sleepy” and watch him come alive. It really helps a horse become de-sensitized to a lot of stuff on many different levels. When your horse doesn’t mind this flagging on the ground, its time to try it when your on the fence. You can shake it up high or reach across his back affecting that other eye. The possibilities are endless. 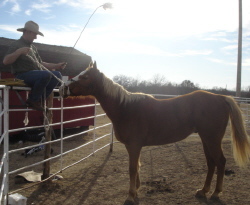 If it’s a colt that hasn’t been ridden yet, you can help him out a lot towards accepting a saddle or you on his back. Remember to go slow. Getting on your horse from the fence. For questions about flagging your horse from the fence, please contact us.